I’ve been there: my MacBook broke down on a tropical island in Thailand, a client deadline 3 hours away and no Apple repair shop in a 500 kilometer radius. You pray to the Apple gods to have mercy (see picture) and you hack your way out of it! We made this journey to attend the awesome “DCBKK” conference in Bangkok. It’s a conference for internet entrepreneurs, and it’s awesome. Before the event we traveled to the tropical island of Koh Lanta (Krabi, Thailand) and after we went to hectic Ho Chi Minh City in Vietnam. At the time I was very busy with client work, working on several projects with tight deadlines. That day my MacBook broke down I had a deadline. An app that I had been working on needed an urgent bug fix. Mistakenly, we had pushed an app to the App Store that had a serious bug in it. Patching it in time was of the essence. After dinner we returned to our hotel to work some more during the evening. I opened my laptop, a recent MacBook Air from 2013, but the screen wouldn’t flash on. Most MacBook have issues with not getting out of sleep mode, so I closed the lid again, opened it and pressed a few keys. That usually wakes it up, but this time no response. Sensing that it had crashed, I tried to restart it. No response. I went through the usual options: performing a hard reset, resetting the PRAM and SMC, but still no effect. I noticed that there was light coming through the Apple logo on the lid. Those older MacBook models have an Apple logo that lights up when you open the lid of the laptop. In that exact spot, on the screen, I could see macOS and my apps. Happy that macOS or any integral hardware wasn’t compromised, I set out to create a working environment. Armed with the flashlight on my iPhone, I logged in on the computer and tried to install an app that could mirror my MacBook’s screen to my iPad. Thanks to the flashlight’s reflection inside the LCD, I could see the screen faintly. I downloaded a screen mirroring app on my iPad and my MacBook. It would use the iPad as a secondary monitor, streaming the MacBook desktop over the hotel WiFi. With those installed, I could work. That’s when my friend took that picture. I’m sitting next to my computer with a tiny iPad Mini that shows my MacBook screen. Ironically, one of the downsides of being an app developer is needing to own a great number of devices. I brought my iPhone, iPad and even an Android phone on the trip, because I had to work with those devices to build my apps. It was a blessing in disguise, because I had just enough tech available to create a workable environment. The irony of course is that relying on the technology makes you dependent and that creates a problem when the tech breaks down. Fun fact: I used my Windows virtual machine on the MacBook for some tasks, creating a Windows on iPad on MacBook setup. Who would have thought? With the mirroring, I could work, so I pushed the app update to my client. The WiFi signal got lost several times, so I had to restart the mirroring connection with the flashlight again. You don’t want to know how annoying it is to look for your mouse cursor with a flashlight on a screen that’s pitch dark! 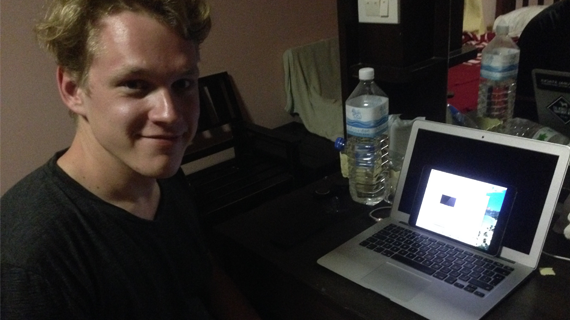 One of the great things of being a digital nomad and having your own business is flexibility. The next I emailed my client that I had taken a couple days off. We were on an island in the middle of nowhere and my MacBook still needed repairs! When you’re traveling, it’s great to bring a secondary device like a smartphone or tablet. You can connect it to your email accounts and contacts, in case you can’t use your laptop. 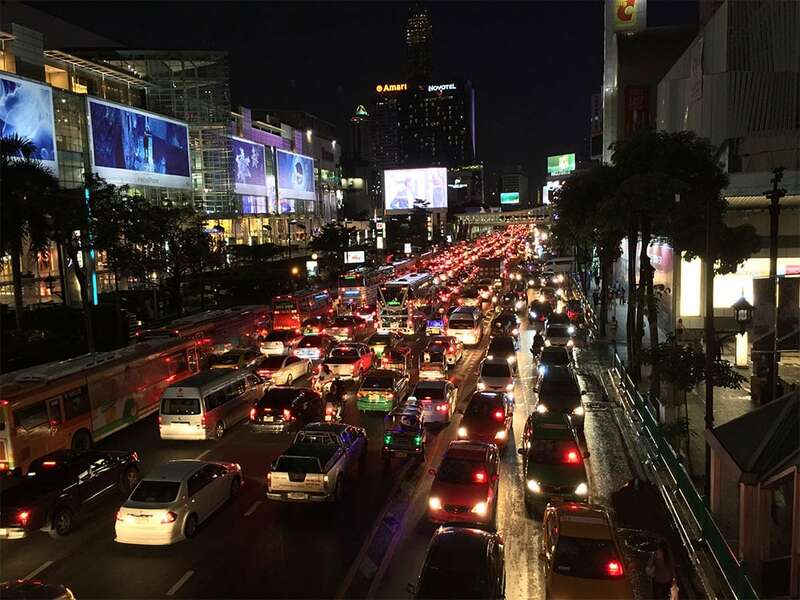 In Bangkok, I took a taxi from our hotel to Pantip Plaza. This mall is infamous for housing the most illegal copies of software in the world in one place. I read online that this mall had an Apple retailer, so I went to their store. They could repair it, but it would take at least 2 weeks. I was only in Bangkok for 3 days, so that wouldn’t work. I pressed them for another option. One of them mentioned a “repair guy” on the top floor of the mall, outside the shopping area. So, up I went. The best stories are off the beaten path. I entered the most densely packed repair shop I’ve seen in my life. There were wires everywhere, computer cases standing all around, and a couple of second-hand MacBooks on display. The room was filled with sweaty chilled air and between some shelves sat a small guy wearing glasses. I knew I had come to the right place. I explained the situation, gave him my MacBook, persuaded him to try to repair the laptop quickly, and he told me to come back the next day. I went back to the conference, and that evening I got the best email ever. 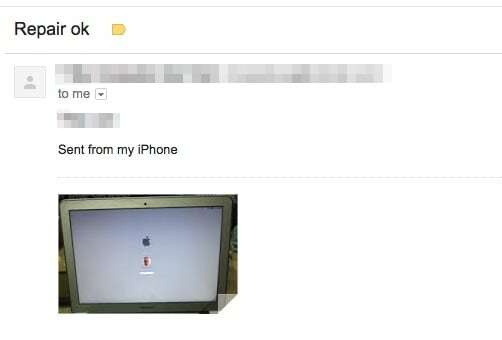 The email shows my MacBook, with a turned on screen, and the simple words “Repair Ok”. Yay, I got my MacBook back! Update: For two consecutive years I returned to the same DCBKK conference. Every time I came home with more stories. Here’s one of the videos I made during a trip in 2016, when I traveled to Japan before the conference.